As seen in Batman/Superman #26, Superman and the new Batman and the old Bat-Family are working together to come up with a plan to stop Vandal Savage and his wicked, dastardly plans. As they discuss their plan, both Gordon and Superman flashback to a time when Superman and Batman trusted each other. The old Gordon smiles at the memory, but the new BatGordon wishes for the old Superman. Superman also longs for those days when he knew Batman would have his back. He doesn't know this new Batman, and he can't read him like he did Bruce. But in the end, they finally decide to trust one another. They go after Vandal, and through teamwork and Vandal's own arrogance they defeat him. Gordon realizes that even a depowered Superman is one worth trusting. He takes off the clunky Bat-Suit and reveals his true identity to Clark. Gordon and Clark shake hands as they begin a new phase of their relationship. Story - 4: The Good: The story is action-packed. The battle against Vandal Savage had me on the edge of my seat. How could these heroes defeat such a powerful man? Even a fully powered Superman would have had to flex his might to defeat such a foe. But the team comes up with a plan that requires brains instead of brawn. Tricking Savage into flying himself away into Earth's orbit was a little corny, but it works. Gordon finally trusting Superman. I hope this means that the "will he/won't he" drama is over. It was getting a little old. The Bad: Why is this issue called, "Red Hood Strikes"? The title and cover make it seem that he is going to be the major player in this issue. But he is featured in just a few panels. His only dialog is to suggest that something be blown up. I like him, and I kinda wish he'd been featured more in this issue. Also, the beginning of the issue irritated me. It felt like a rehash of all the Bat/Sup issues that we have been having for months. How can BatGordon depend on the new depowered Superman? Can Superman depend on a new Batman? How can Superman gain his trust? I was like, 'Really?' THIS? AGAIN? Conclusion: The beginning of this issue bored the crud out of me with old trust issues, but I liked where we ended up. Art - 5: I like the grittiness that Jack Herbert brings to the flashback scenes. The colors are a bit subdued, but the characters are more hopeful. It was nice to see the pre-mohawk Gordon. Richard's fight scenes are violent with blood spatters and brutal kicks, punches and explosions. Loved it, loved it. And... loved it. Cover Art - 3: I liked the action-packed cover. And I would have given it a 4, but the cover has nothing to do with what's inside the issue. Why is Red Hood shooting at Superman? He doesn't do so inside the comic. 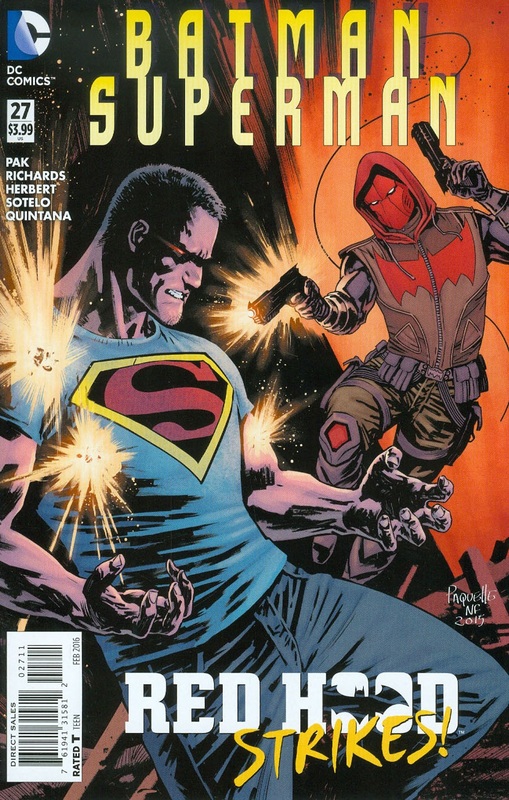 As a matter of fact, Red Hood has so little to do with this story that I felt a little lied to. Otherwise Paquette and Fairbairn created a great cover.